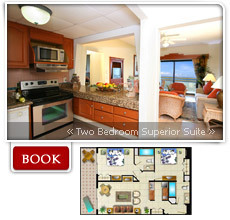 Comprised exclusively of suites, Paradise Village Beach offers exceptional guest accommodations. Choose from spacious Junior, 1, 2 and 3 Bedroom suites, each lavishly appointed with every luxury and convenience, including a fully equipped kitchen, marble baths and designer decor. Spread out in a spacious living rooms or relax outdoors on a private terrace while enjoying great ocean, marina or garden views. Extensive in-room amenities complement each suite. Telephone with direct-dial long distance. Cable Television, remote control and premium movie channels. blender, coffee maker, toaster and utensils. Purified and softened tap water. Beautifully decorated suite with one Queen bed plus queen sofa-bed in living room or two double beds with love seat. 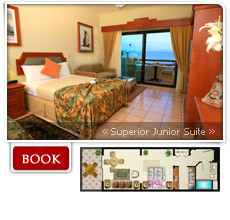 Air conditioning, ceiling fan, Cable TV in English and Spanish, direct dial phone, in-room safe and clock / radio. Full marble bathroom, hair dryer, separate Kitchen with full-size refrigerator, sink with purified tap water, stove, microwave and dining area. 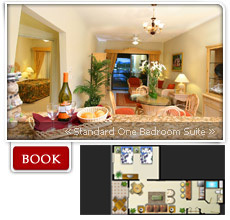 Room opens to balcony with marina or resort views of tropical gardens/palms. Short walk to pools/beach/restaurant. Max 2 adults - 2 children. Daily activity programs for both adults and children. Nightly entertainment and weekly live shows. Main pool with children's wading area. Entertainment room featuring ping pong, pool, several board games and games tables. Adjacent to the lobby bar. Indoor and outdoor “Kid’s Club” with fully supervised children’s activities. Max 6 people (including children). HOLA special offers Club & Spa is located in one of the most beautiful bays of the Mexican Pacific, with a unique beachfront location in the heart of hotel area, only 10 minutes from the airport and 5 minutes away from downtown banderas bay the only waterfront "Mexican Pueblito”. The friendliest team in the hotel industry. 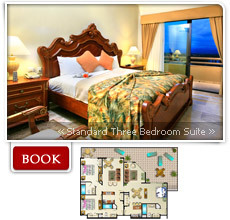 Accommodations offering 218 rooms and 4 suites in 3 buildings overlooking the ocean. All meals (buffet breakfast, daytime and late night snacks, lunch and dinner with gourmet dining). 24-hour food and beverage program. 4 restaurants including “a la carte” dining. Unlimited domestic alcoholic beverages, wine, beer, soft-drinks and non-alcoholic drinks. Max 2 people (including children). Comfortable apartments with two double beds in bedroom plus one queen sofa-bed in living room. Air conditioning, ceiling fan, Cable TV in English and Spanish, direct dial phone and clock/radio. 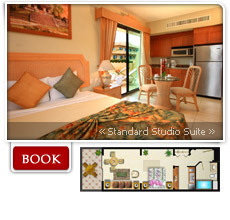 Room opens to balcony with resort views of tropical gardens/palms among the buildings of Paradise Village. One bathroom with shower and hair dryer. Kitchen/dining area with full-size refrigerator, sink with purified tap water,stove, convection/microwave, and dining table/chairs. Short walk across the street to pools/beach/restaurants. Max 4 people (including children). Comfortable apartment with king bed in master bedroom plus two double beds in second bedroom and two double beds in third bedroom. Queen sofa-bed in living room. Air conditioning, ceiling fan, Cable TV in English and Spanish, direct dial phone and clock /radio. Rooms open to balconies with resort views of tropical gardens/palms among the buildings of Paradise Village. Three bathrooms with shower and hair dryer. Kitchen/dining area with full-size refrigerator, sink with purified tap water, stove, convection/microwave, dishwasher, washer & dryer and dining table/chairs. Short walk across the street to pools/beach/restaurants. Max 8 people (including children).